The Asian Civilisations Museum (ACM) is arguably Singapore’s most impressive museum, filled with art and artefacts from all over Asia emphasising the diversity of ethnicities and religions to be found in the continent. The permanent exhibits have dedicated sections for many of the major religions in Asia, including Islam, Daoism, and Buddhism. These are complemented by another set of exhibits centred on the multitude of ethnic groups that can be found in the region as well. Put together, they present the cultures of Asia in their full colour and richness. The interactive video terminals scattered through the exhibits help to contextualise the artefacts on display by explaining their historical context as well as their significance for people belonging to the respective ethnic and religious groups today. The ACM has another permanent exhibition inspired by its location along the Singapore River, which focuses on the role of the river throughout Singapore’s history as a conduit for trade and communication. 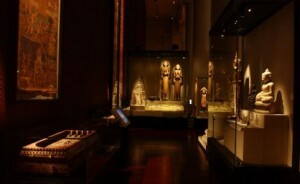 Furthermore, the museum also occasionally hosts special exhibitions that are in line with the museum’s aim of showcasing Asia’s cultural heritage. Recent examples include Treasures of the Aga Khan Museum: Architecture in Islamic Arts and Patterns of Trade: Indian Textiles for Export, 1400-1900. The ACM is unrivalled in its comprehensive overview of Asian ethnicities and religions, offering visitors great insight into the diverse cultures that seem to converge in Singapore. The ACM is located along the Singapore River, and is easily accessible by MRT at either Raffles Place station on the East-West (Green) Line or Clarke Quay station on the Northeast (Purple) Line. More information is available at the ACM website here: http://www.acm.org.sg.